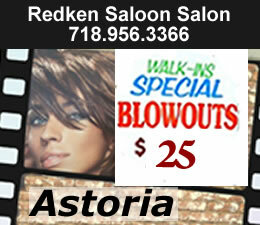 December 7, 2010 / Jackson Heights / Queens Buzz. 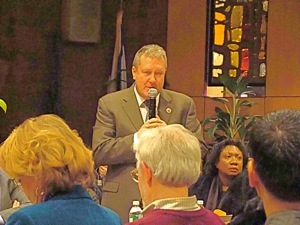 City Council Member Daniel Dromm, NYS Senator Peralta in tandem with ACCO [Alliance of Condo & Co-op Owners] organized a forum in Jackson Heights to inform people about their rights and responsibilities as condo and co-op owners. 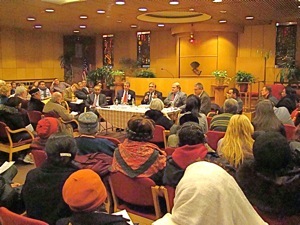 The panel informed condo and co-op owners in Jackson Heights & Queens about their rights, and discussed new state legislation which has been introduced to more clearly define the processes through which a tenant / owner can assert their rights. 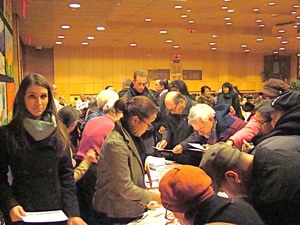 Click here to read the rest of our report about the forum for owners of Jackson Heights condo / co-ops in Queens. Continued / December 6, 2010 / Jackson Heights / Queens Buzz. The first speaker, Kevin McConnell, outlined the general legal structure and current avenues through which an owner / tenant can press grievances. 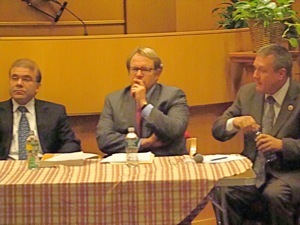 Seated in the photo below [L to R] Lucas Ferrara, Kevin McConnell and Daniel Dromm. The condo owner / co-op owner lease generally outlines the lessee’s obligations and responsibilities. The intent of the lease is generally to protect the co-op or condo as a whole. 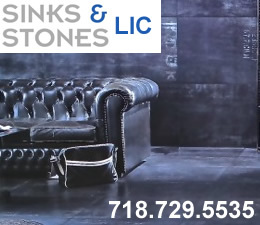 Obligations include timely payment of maintenance and other fees, as well as setting standards for the overall maintenance of the co-op or condo unit. Most co-ops and condos also have clauses requiring shareholders / owners to refrain from objectionable behavior. 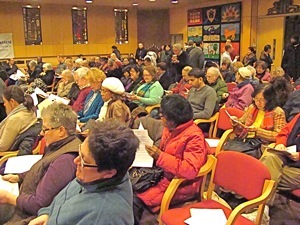 In the photo to your right a full house at the Jewish Center in Jackson Heights. What’s not well-defined, is the process through which an owner / tenant of a condo or co-op is able to assert their rights, should an issue ever arise. As previously mentioned, the governance documents outlined above are generally designed to protect the condo or co-op as a whole, but abuses can occur when those in charge of managing the process are either abusive or negligent. 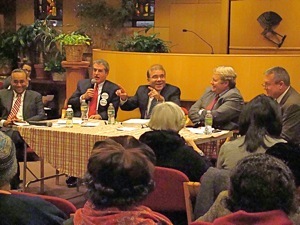 One clear bit of advice, which was repeated by all panelists throughout the evening, was that the best way to assert one’s rights was to: 1) document any requests to the building board or managing agent and 2) solicit help from neighbors who are also shareholders. The last course of action is of course litigation. A couple of court cases were cited to show how boards can exercise their power. One case included a board’s refusal to let the tenant move their kitchen as the board believed there was risk to the building plumbing infrastructure. The tenant hired an engineer who stated that that was not the case. And a second case was about how a man ‘engaged in objectionable behavior’ [a fist fight] and hence, over time, eventually lost his unit without being able to go through a due process such as the one provided in civil courts. 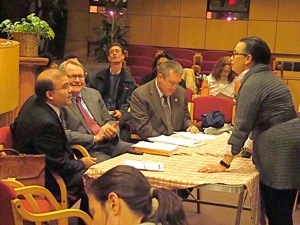 The photo at right shows NYS Senator Peralta speaking at the Forum for Condo and Co-op owners in Jackson Heights. He then went on to cite a couple of instances where board members didn’t properly handle their fiduciary responsibility. He also advised that one can dial 311 to have the government send out inspectors to make sure that a condo or co-op conforms to city standards for things like adequate heating. And lastly, he advised, when you’re preparing to litigate make sure you document things, including the use of certified mail / delivery. 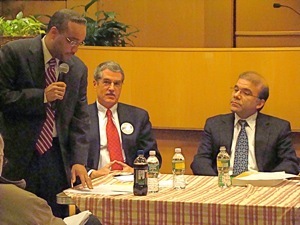 The third speaker was Larry Simms, the president of ACCO [Association of Condo & Co-op Owners]. He spoke about his own experiences as a condo / co-op owner and how ACCO came into being. The concept for ACCO crystallized following his attendance at a forum similar to the one I was at this evening. The guest speaker was someone from the NYS attorney’s office and her response to many of the questions at the forum was, “This isn’t our job. This isn’t what we do.” He went on to say that while there are other organizations that address co-op and condo owner issues, they approach them largely from the point of view of the building sponsors or boards. 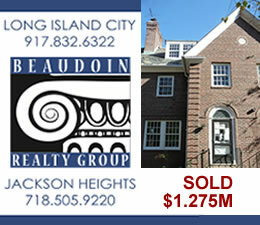 The graphic above is the ACCO logo which may be found at condocoopowners.org. He then went on to share a few stories with us from disgruntled tenants who had attempted to assert their rights. One included a co-op owner / tenant complaint about the violation of a no barbeque rule by a board president. Another was from a condo owner tenant who’s kitchen ceiling fell in due to what appeared to be building plumbing issues. A third was from a condo owner whose board appeared to be ignoring imminent problems with significant price tags. And a fourth was about a conflict of interest by a board president, who was also in the employ of the building management company. 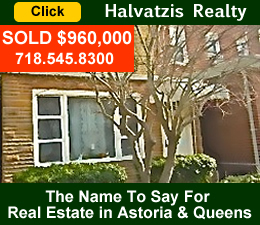 Click here to go to the home page of Halvatzis Realty in Astoria, Beaudoin realtors in Jackson Heights and Welcome Home Real Estate in Sunnyside. 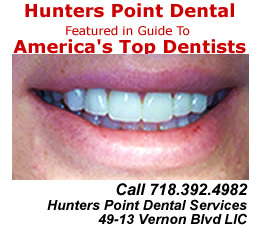 Click here to go to the home page of Ponce De Leon Bank for Mortgages In Astoria & Queens. 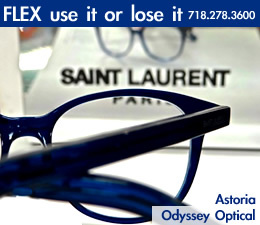 Click here to go to the home page of an Allstate insurance agency for Home Insurance In Astoria & Queens. 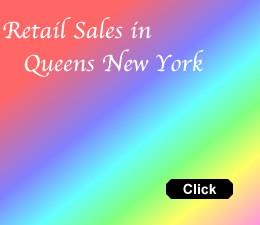 Queens Buzz Site Search. 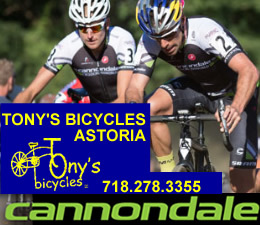 1) for best results, when typing in more than one word, use quotation marks - eg "Astoria Park" and 2) try both singular and plural when searching for a specific item such as "gym" or "gyms".